In What Order Should Students Learn Fast Math Facts? Basic, Optional, and Alternative—there are a lot of different Rocket Math programs. But which program should you use first? And in what order should you teach fast math facts? Well, it all depends on the grade you teach and the fast math facts your students have already memorized. 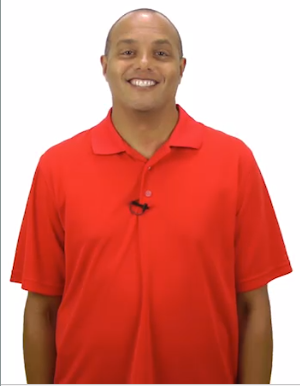 Rocket Math offers multiple programs because their are several ways to teach fast math facts. Rocket Math’s basic program includes Addition, Subtraction, Multiplication, and Division (1s-9s). The basic program must be mastered by all students. There is another way to learn facts, which is called Fact Family math. Instead of learning all Addition facts, students can learn Addition and Subtraction facts at the same time. A fact family consists of four related facts, for example: 3+2 = 5, 2 + 3 = 5, 5 – 3 = 2, 5 – 2 = 3. As an alternative to using the Basic Program, students can learn fact families up to 10 in first grade. Then students can move on to the upper fact families 11 to 18 in second grade. There is no clear evidence that this way is better or the separate operations way is better. That’s why we offer both options. The rest of the fast math facts programs like Rocket Writing for Numerals or Skip Counting are optional. You should only offer these programs to students once they have memorized the fast math facts through the Basic Program or the Alternative Program. The only exception would be in a school where Kindergarteners did not get a chance to learn how to quickly and easily write numerals. In that case, you might take the first two months of the first grade year to run students through Rocket Writing for Numerals before beginning Addition (1s-9s). Here’s a link to a printable version of the different Rocket Math programs shown in the graphic above. Let’s take a closer look at how to implement each program in different grade levels. If first grade students are taking all year to get through sets A-Z in Addition in the Basic Program, they need some extra help. You should intervene to help students who take more than a week to pass a level. Often they need to practice better or practice with a better partner. Some may need to practice a second time during the day or at home in the evening. First grade students who finish the 1s-9s can move on to the Add to 20 Optional Program for the remainder of the year. Likewise, if you choose to teach Fact Families (1-10) Add & Subtract from the Alternative Program instead of using the Basic Program, your students can use the Optional Programs for supplemental learning purposes. Second grade students must have completed Addition before starting on Subtraction (1s-9s). They can also test out of Addition through the Placement Probes. Second graders who cannot test out of Addition in first grade or didn’t complete it in first grade must focus on Addition. Only after getting through Set Z of Addition should they move into Subtraction. You can substitute the Basic Program’s (1s-9s) Addition and (1s-9s) Subtraction for the Alternative Program’s Fact Families (1-10) Add & Subtract and Fact Families Part Two (11-18) Add & Subtract. Second grade students who complete Addition and Subtraction 1s-9s (or the Alternative Program) can move on to Subtract from 20. Students who finish Subtract from 20 can do Skip Counting, which does a great job of preparing students to learn Multiplication facts. In third grade, Multiplication has priority—even if students have not mastered Addition and Subtraction. 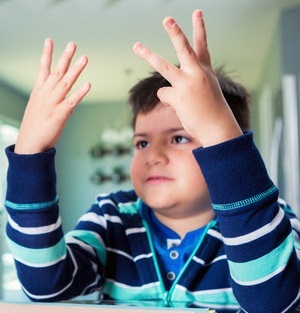 Multiplication facts are so integral to the rest of higher math that students are even more crippled without Multiplication facts than they are having to count Addition and Subtraction problems on their fingers. So do Multiplication first. Then, if there’s time, students who need to do so can go back and master Addition and Subtraction. Once all three of these basic operations are under their belts, students can go on to 10s, 11s, 12s in Multiplication (one of the Optional Programs). If students successfully progress through each program and there is enough time left in the school year, introduce the Factors program next. In fourth grade, students need to have completed Multiplication before going on to Division. If they complete Division, they can go on to 10s, 11s, 12s Division, followed by Factors, and then equivalent fractions (shown in the fifth grade section below). 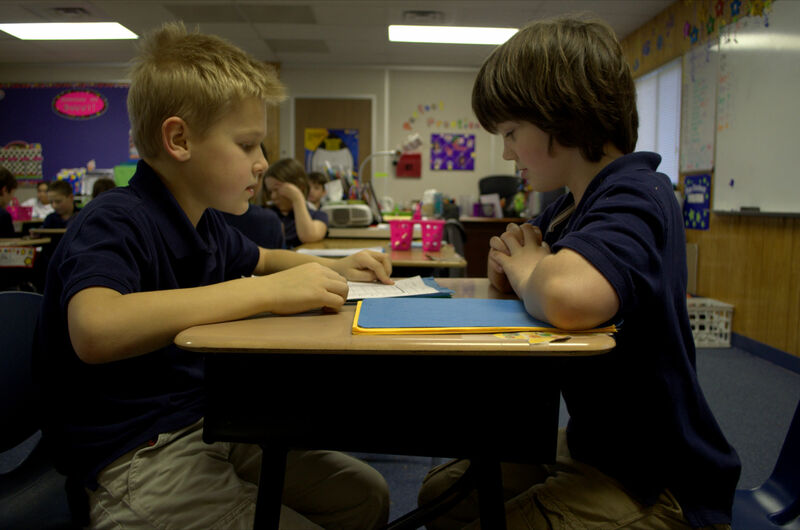 By fifth grade, students should have completed all four basic operations (1s-9s) within the Basic Program (or the Alternative Program for grades one and two). If students have not completed these basics (and cannot test out of them with the Placement Probes) then the sequence they should follow is Multiplication, followed by Division, then go back and complete Addition followed by Subtraction. The same recommendations hold for students in any grade after fifth. There are plenty of math facts apps out there that let students practice math facts they have already learned. Few apps actually teach math facts. But apps from Rocket Math and XtraMath are exceptions. While both apps teach students math facts, one is more effective and fun. Both math facts apps require students to demonstrate fluency with facts. Fluency means a student can quickly answer math fact questions from recall. This is the opposite of letting a student “figure it out” slowly. Neither app considers a fact mastered until a student can answer a fact consistently within 3 seconds. Both math facts apps zero in on teaching (and bringing to mastery) a small number of facts at a time. This is the only way to teach math fact fluency. It’s impossible for students to learn and memorize a large number of facts all at once. Both math facts apps are responsive. Apps simply do not teach if they randomly present facts or do not respond differently when students take a long time to answer a fact. Both math facts apps only allow students to work for a few minutes (less than ten) before taking a break. Teachers and parents may want to keep students busy practicing math facts for an hour, but students will come to hate the app if they have long sessions. A few minutes of practice in each session is the best way to learn and to avoid student burnout. Both math facts apps re-teach the fact if a student makes an error. While both Rocket Math and XtraMath re-teach facts, they re-teach them differently. 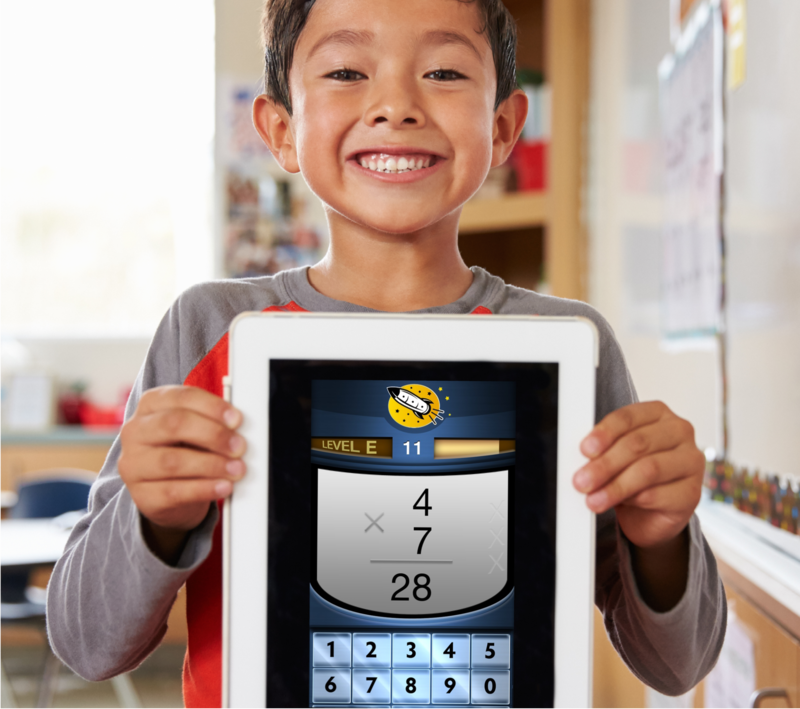 While both apps contain these important features and teach math facts, there are a few vital elements that make an effective app like Rocket Math standout. The difficult thing about learning math facts is that there are so many to learn. It takes a while and students have to persevere through boring memorization tasks. The best way to help students learn their math facts is to give them a clear sense of accomplishment as they move through each task. 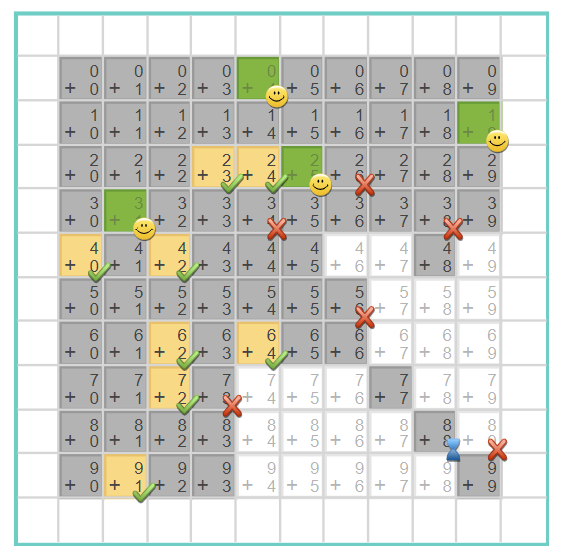 To develop a sense of accomplishment among its app users, XtraMath displays math facts on a grid. XtraMath tests the student and marks the ones that are answered quickly (within 3 seconds) with smiley faces. It takes a couple of sessions to determine what has been mastered and what hasn’t, so there isn’t a sense of accomplishment at first. This grid is displayed and explained, but it’s not easy to monitor progress. Over time, there are fewer squares with facts to learn, but there isn’t clear feedback on what’s being accomplished as students work. Conversely, Rocket Math begins recognizing student progress immediately and continues to celebrate progress at every step. 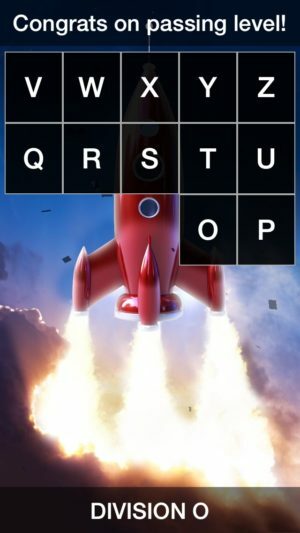 The Rocket Math app begins with Set A and progresses up to Set Z. Each lettered set has three phases: Take-Off, Orbit, and the Universe. That means there are 78 milestones celebrated in the process of moving from Set A to Set Z. In addition to the three phases, students progress through the sets from A to Z. Each time a student masters a set, by going through all three phases, the student gets congratulated and taken to their rocket picture, as shown above. 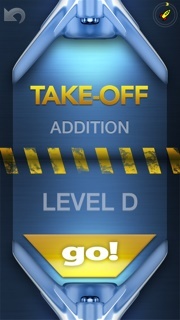 When a level is completed, the tile for that level explodes (with appropriate sound effects) and drops off the picture, gradually revealing more of the picture as tiles are demolished. In the picture above, the tile for “N” has just exploded. After the explosion, a student is congratulated for passing Level N and encouraged to go for Level O if they dare. When you talk to students about Rocket Math, they always tell you what level they have achieved. “I’m on Level K!” a student will announce with pride. That sense of accomplishment is important for them to keep chugging along. Neither of these math fact apps allow errors to go uncorrected. Students will never learn math facts from an app that does not correct errors. That puts these two apps head and shoulders above the competition. However, these two apps correct errors very differently. On the left, you can see the XtraMath correction is visual. 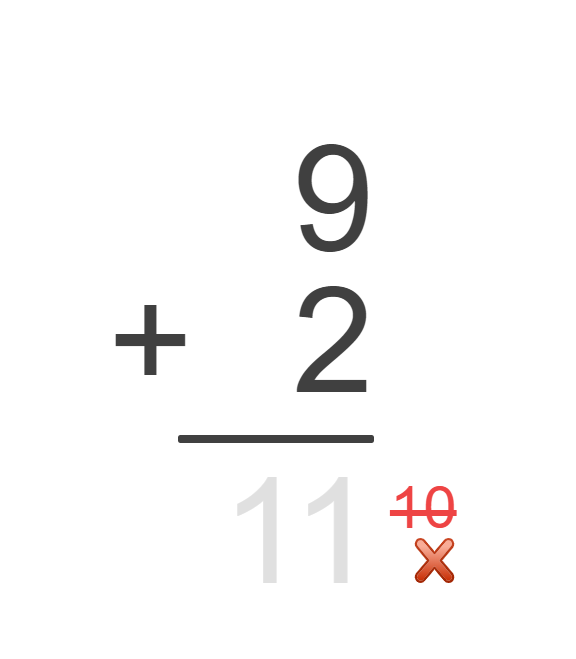 If a student enters the wrong answer, the app crosses the incorrect answer out in red and displays the correct answer in gray. A student then has to enter the correct answer that they see. This is a major mistake. In this case, students don’t have to remember the answer. They just have to enter the numbers in gray. Rocket Math, however, provides only an auditory correction. When a student answers incorrectly, the screen turns orange and Mission Control recites the correct problem and answer. In the pictured situation, Mission Control says, “Three plus 1 is four. Go again.” Under these conditions, the student has to listen to the correction and remember the answer, so they can enter it correctly. Following an incorrect answer to a target problem, the app presents two more problems. Then it presents the previously target problem, on which the student made the error, again. If the student answers the previously missed problem correctly within the three seconds, the game notes the error, and the student continues through the phase. If the student fails to answer the problem correctly again, the correction process repeats until the student answers correctly. Having to listen to and remember the answer, rather than just copy the answer, helps students learn better. Without feedback, students can’t learn efficiently and get frustrated. But the feedback cannot be generic. It has to dynamically respond to different student behavior. XtraMath’s charming “Mr. C” narrates all of the transitions between parts of each day’s lesson. He welcomes students, says he is happy to see them, and updates students on their progress. He gives gentle, generic feedback about how you’re getting better and to remember to try to recall the facts instead of figuring them out. However, his feedback remains the same no matter how you do. In short, it is non-contingent feedback, which may not be very meaningful to students. Differing from XtraMath, Rocket Math offers students a lot of feedback that is contingent. Contingent feedback means that students will receive different types of feedback depending on their responses. 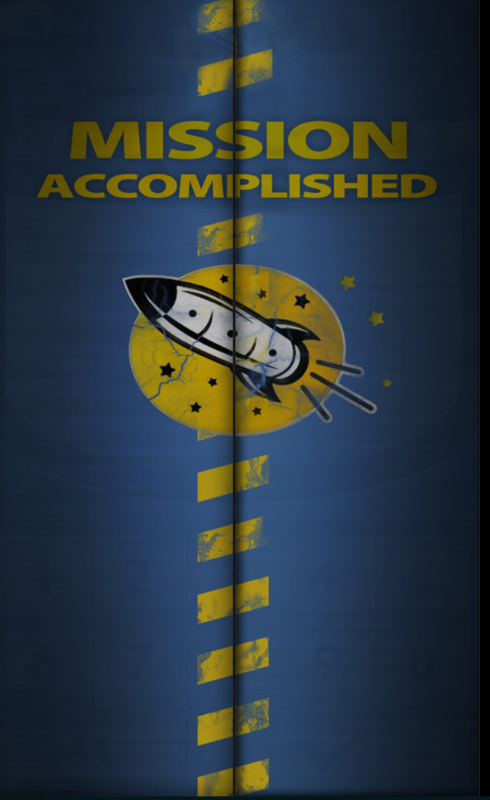 The Rocket Math app gives positive feedback for all the 78 accomplishments noted above. It also doles out corrective feedback when the student isn’t doing well. As noted above, students receive corrective feedback on all errors. They get feedback when they take longer than three seconds to answer too. 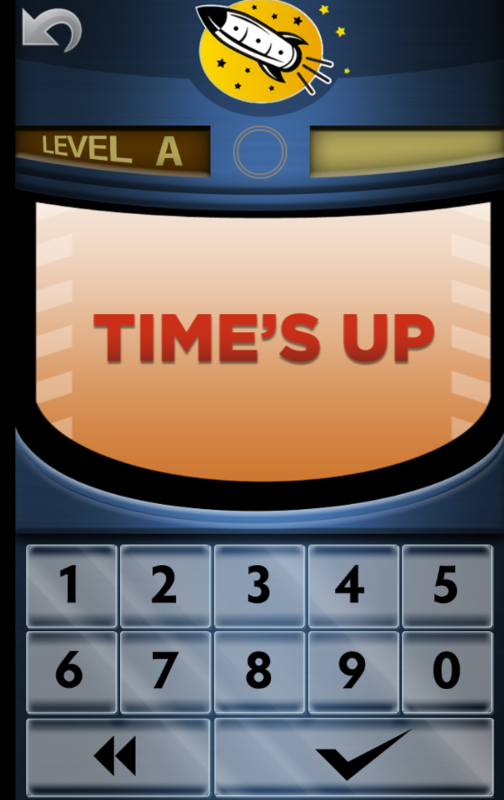 The “Time’s Up” screen on the right pops up and Mission Control says, “Ya’ gotta be faster! Wait. Listen for the answer.” And then the problem and the correct answer are given. Students get a chance to answer that fact again soon and redeem themselves–proving they can answer it in 3 seconds. The app tracks errors and three strikes mean the student has to “Start Over” with that phase. At that point, the doors close (with appropriate sound effects) and then the student has to hit “go” and the doors open (with appropriate sound effects) to try it again. 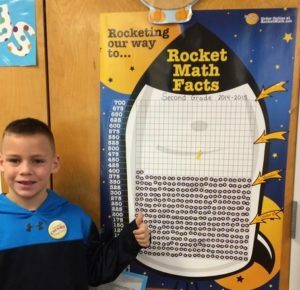 When it comes to recognizing a student’s success, the Rocket Math app holds nothing back. After a student completes a phase, Mission Control gives enthusiastic congratulations as noted above. Typically, students don’t have to “start over” more than once or twice in a phase, but they still feel a real sense of accomplishment when they do complete the phase. The feedback students get from Rocket Math matters because they have to work hard to earn it. How much does an effective math facts app cost? It is hard to beat the price of XtraMath, which is free. 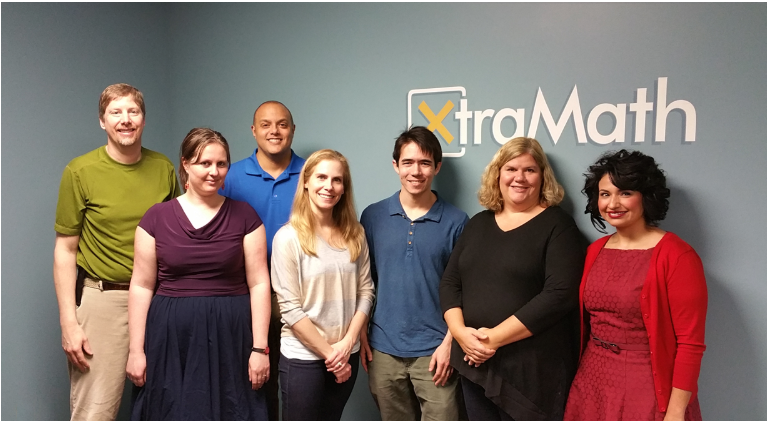 XtraMath is run by a non-profit based in Seattle. They have a staff of six folks in Seattle, and they do accept donations. Their product is great, and they are able to give it away. Most elementary teachers do some activities to promote math fluency. Yet many elementary children are not fluent with math facts by the time they hit upper elementary or middle school. A hit-or-miss approach allows too many students, especially the most vulnerable, to slip through the cracks. Math fluency programs, like Rocket Math’s Worksheet Program, need to be part of your elementary school’s routine. Effective math fluency programs should be properly structured and every math teacher should be on board, every year. Many teachers learn in their training programs about the importance of “number sense.” Students who have “number sense” can easily and flexibly understand relations between numbers. They can recombine numbers in various ways and see the components of numbers. Students with number sense can intuit the fact that addition and subtraction are different ways of looking at the same relations. What is not taught in most schools of education is that developing fluency with the basic math facts ENABLES the development of number sense much better than anything else. Once students memorize facts, they are available for students to call upon to understand alternate configurations of numbers. Students find it much easier to see the various combinations when they when they can easily recall math facts. Once students master the basic facts, math games that give flexibility to thinking about numbers become much easier. It may be hard for new teachers, straight from indoctrination in the schools of education, to imagine this is true. However, if they land in an elementary school with a strong math fact fluency program they will see the beneficial effect of memorization. In the primary grades, students who have not developed fluency in math facts will have a harder time learning basic computation. Students who are not fluent with math facts find the worksheets in the primary grades to be laborious work. They finish fewer of them and may begin to dislike math for this reason. By the time students reach upper elementary, if they have not memorized the math facts, they find it very difficult to complete math assignments at their grade level. They find themselves unable to estimate or do mental math for problem-solving. The need to figure out math facts will continue to distract non-fluent students while they are learning new math procedures like algorithms. In the upper grades, their inability to figure out multiplication facts becomes a huge stumbling block. Manipulations of fractions, decimals, and percentages will not make intuitive sense to students because they haven’t memorized those facts. Without math fact fluency, students rarely succeed in pre-algebra and may be prevented from learning algebra and college-level math entirely. 1. Are students gradually improving their fluency with all the facts gradually over the year? In other words, are students able to answer more facts in the same amount of time? If they aren’t improving, then the instructional procedures aren’t working and need to be modified or replaced. Math fluency programs like Rocket Math’s Worksheet Program have two minute timings of all the facts in each operation that can be given and the results graphed to see if there is steady improvement. 2. 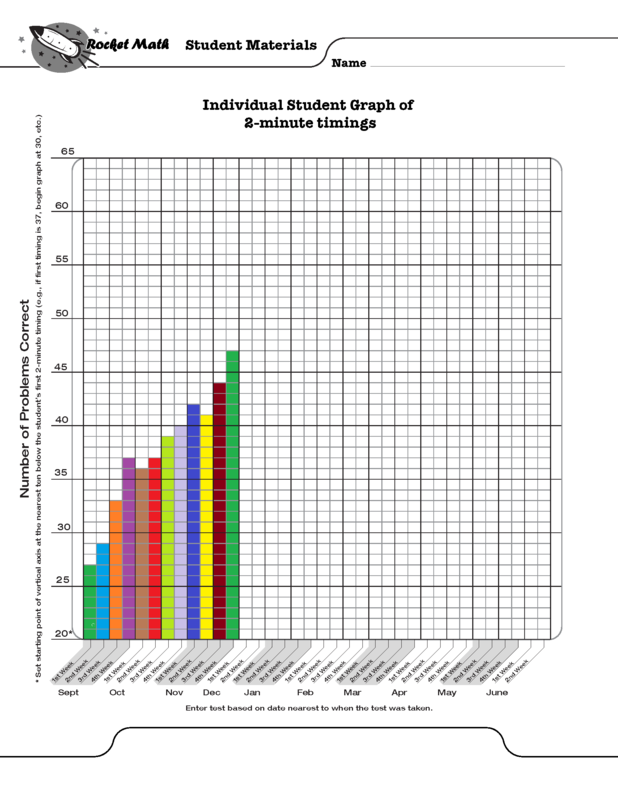 Are all students reaching expected levels of performance at each grade level each year? Proper math fluency programs identify students who are not meeting expectations and give them more intensive interventions. Ultimately, by the end of fourth grade all students should be able to fluently answer basic 1s – 9s fact problems from memory in the four operations of add, subtract, multiply and divide. Fluent performance is generally assumed to be 40 problems per minute, unless students cannot write that quickly. Expectations vary by grade level and the sequence with which schools teach facts can vary. While it is great to achieve all that the Common Core suggests, it is critical only to assure that students master and gain fluency in 1s through 9s facts. 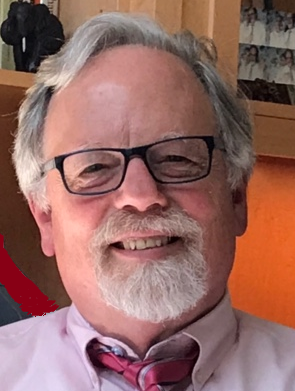 Some schools in some neighborhoods may find that waiting until second grade to begin math facts may not provide enough time for all students to achieve fluency. When to begin fact fluency and how much to expect each year should be based on experience rather than some outside dictates. No one can memorize ten similar things, like the 2s facts, all at once. Students easily master math facts when they can learn and memorize small amounts of facts at one time. Effective math fluency programs define math fact sequences, which students memorize at their pace before moving onto new math facts. Rocket Math’s fluency program uses only two facts and their reverses in each set from A through Z. Even if you only introduce small sets of math facts, some students need more time to memorize than others. If you introduce the facts too fast, students will begin to jumble them together and progress will be lost. The pace of introducing facts must be based on mastery—not some pre-defined pace. This is why doing all the multiplication facts as a class in the first six weeks of third grade does not work. It is just too fast for some students. Once they fall behind it all becomes a blur. When students are practicing facts, they will come to ones they have forgotten or can’t recall immediately. Those are the facts on which they need more practice. Allowing students to stop and figure out the facts they don’t know while practicing, does not help the student commit them to memory. Instead, students need to IMMEDIATELY receive the fact and the answer, repeat it and try to remember it. Then they need to attempt that fact again in a few seconds, after doing another couple of problems. If they have remembered the fact and can recall it, then they are on their way to fluency. But students must practice the next day to cement in that learning. 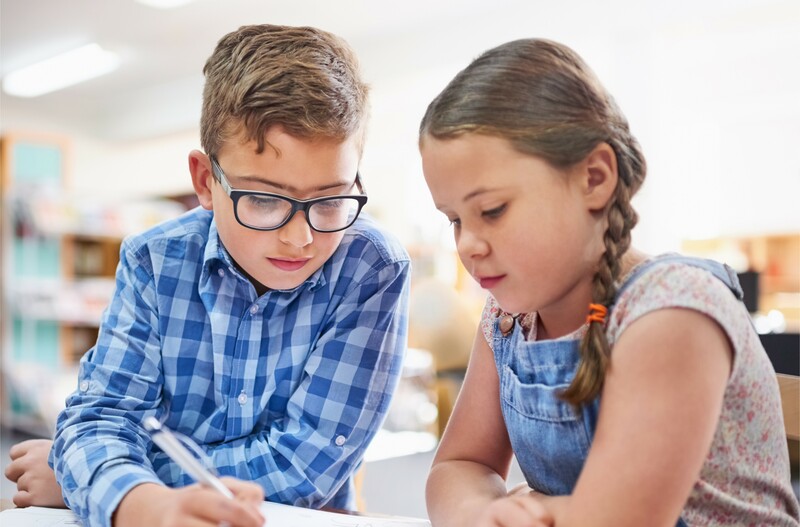 Math fluency programs like Rocket Math’s Worksheet Program teach students math facts in small sets, allow students to progress at their own pace, and support effective practice and error correction. Each Rocket Math Worksheet program has 26 (A to Z) worksheets specially designed to help kids gradually (and successfully) master math skills. Gain access to all of them with a Universal Subscription or just the four basics (add, subtract, multiply, divide–1s to 9s) with a Basic Subscription. Does Your Kid’s App Teach Math Fact Fluency – Or Waste Time? There are a lot of apps out there that look like they would help your child learn math fact fluency. If they have to answer math facts, won’t that work? Not really. Just playing a game that asks you to answer facts won’t help you learn new facts. In fact, most apps for practicing facts are discouraging to students who don’t know their facts well. Why? Because most of the people designing the app don’t have any experience teaching. A teacher, like the creator of the Rocket Math App, is trained to effectively teach new math facts (or any facts) to a student and knows an effective math app from an ineffective one. The app has to tell the problem and the answer to the student. It has to ask the student to give the correct answer to the problem. It has to ask the problem again after a short delay to see if the student can remember the answer. Without doing these three things there’s no way the app is going to be able to teach a new fact to the student. Nobody can learn a bunch of new and similar things all at the same time. A person can only learn two, three, or four facts at a time. You cannot expect to learn more. * That’s enough for one session. The student has to practice those facts a lot of times to commit them to memory. Once or twice is not enough. It also won’t help to practice the same fact over and over. Proper math fact fluency practice intermingles new math facts along with facts the learner has already memorized. However, no more than two to four facts should be introduced at a time. If a student has to answer a lot of random untaught math facts, you will have a very frustrated learner. Some students learn to solve addition problems by counting on their fingers. That’s a good beginner strategy, but students need to get past that stage. They need to be able to simply and quickly recall the answers to math facts. An app is good for developing recall. But the app has to ask students to answer the facts quickly, faster than they can count on their fingers. The app has to distinguish when a student is recalling the fact (which is quick) from figuring out the fact (which is slow). Second, the app must repeatedly ask the learned facts in a random order, so students are recalling. But the app should not throw in new facts until all the facts are mastered and can be answered quickly. The trick to effectively teaching math facts is to introduce new math facts at an appropriate pace. If you wait too long to introduce math facts, it gets boring and wastes time. If you go too fast, students become confused. Before introducing new facts, students need to master everything you’ve given them. An effective app will test whether students have mastered the current batch of math facts before introducing more facts. And it will also introduce math facts at a pace based on student mastery. That’s the final piece of the puzzle to ensure students learn math facts from an app. 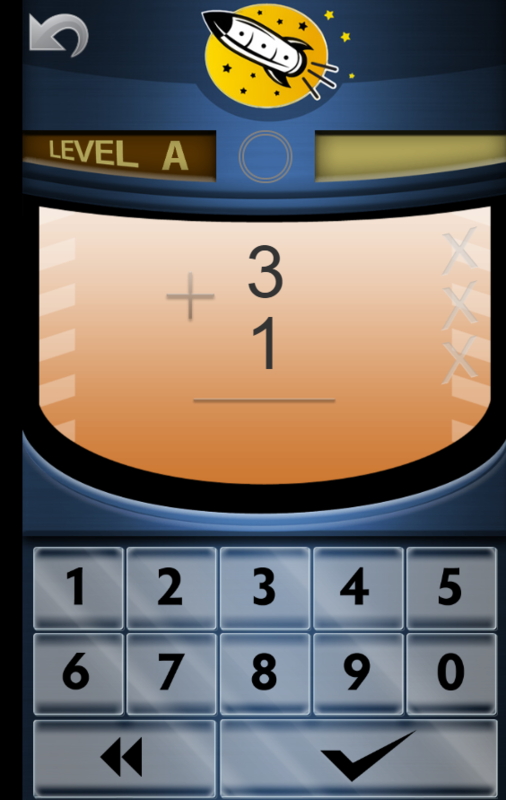 *Rocket Math App focuses on two facts and their reverses at a time, such as 3+4=7, 4+3=7, 3+5=8 and 5+3=8. As a university supervisor of pre-service teachers, I’ve seen my share of bad lessons. Among the most painful were when student teachers would try to liven up their lessons to impress me by having the students do a math game. My student teachers wanted their students to learn math facts and to do so in a fun way. The picture above is typical of what I would see. Here are the reasons that most multiplication games that the student teachers implemented were awful. Waiting for your turn at a multiplication game is not learning! As you can see in the picture above, all but one of the students are just waiting for their turn. They aren’t doing math. The students are just watching the student who is playing. No one likes waiting, and your students are no exception. Any game that has turn-taking among more than two students wastes time. Make sure your multiplication games are structured so all or most students are engaged and playing all the time. You want students to have as much engaging practice as possible while practicing math facts at speed. If everyone can be doing that at the same time, that’s optimal. No more than two students should be taking turns at a time. A multiplication game that allows using a known strategy to figure out facts (like finger counting) is not learning! Learning math facts involves memorizing these facts so that students know them by memory, by recall. Committing facts to memory is why there is a need for lots of practice. 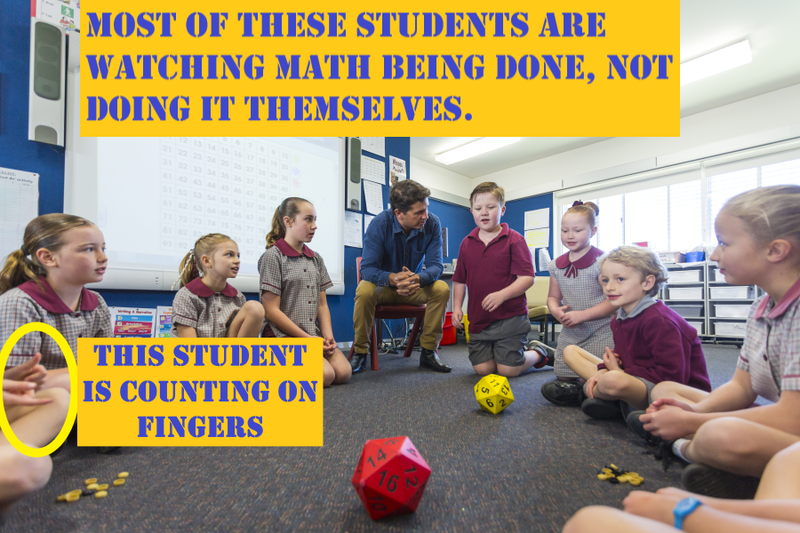 If the game allows time for students to count on their fingers or use some other strategy for figuring out the answer to facts, then there is no incentive for students to get better. In the lower left corner of the picture you can see one student counting on their fingers—which is better than just watching—but is not learning the facts, it is just figuring them out. The most able students in an elementary school are able to memorize facts on their own when they tire of figuring them out day in and day out. But the rest of the students will just do their work patiently year after year without memorizing if you don’t create the conditions for them to memorize facts. Make sure that your multiplication games reward remembering facts quickly rather than just figuring them out. Speed should be the main factor after accuracy. Fast-paced games are more fun and the point should be that the more facts you learn the better you’ll do. Multiplication games that randomly present ALL the facts make learning impossible. It is a basic fact of learning that no one can memorize a bunch of similar things all at once. To memorize information, like math facts, the learner must work on a few, two to four facts, at a time. With sufficient practice, every learner can memorize a small number of math facts. Once learners master a set of math facts, they can learn another batch. But if a whole lot are presented all at once, it is impossible for the learner to memorize them. Make sure your multiplication games are structured so that each student is presented with only facts they know. A good game presents only a few facts at a time. As students learn some of the math facts, more can be added, but at a pace that allows the learner to keep up. The optimal learning conditions are for the learner to have a few things to learn in a sea of already mastered material. We designed Rocket Math games to help kids gradually (and successfully) master math skills. 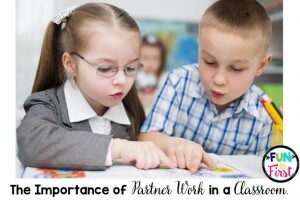 Students use Rocket Math’s Worksheet Program to practice with partners, then take timings. Students can also individually develop math fact fluency—from any device, anywhere, any time of day—with Rocket Math’s Online Game. Katy L from Wilson Elementary asks: How can I keep up with everyday Rocket Math grading? Do you teach students to grade their own 1-minute math fluency practice tests? An integral part of the Rocket Math Worksheet Program is the 1-minute math fluency practice test. 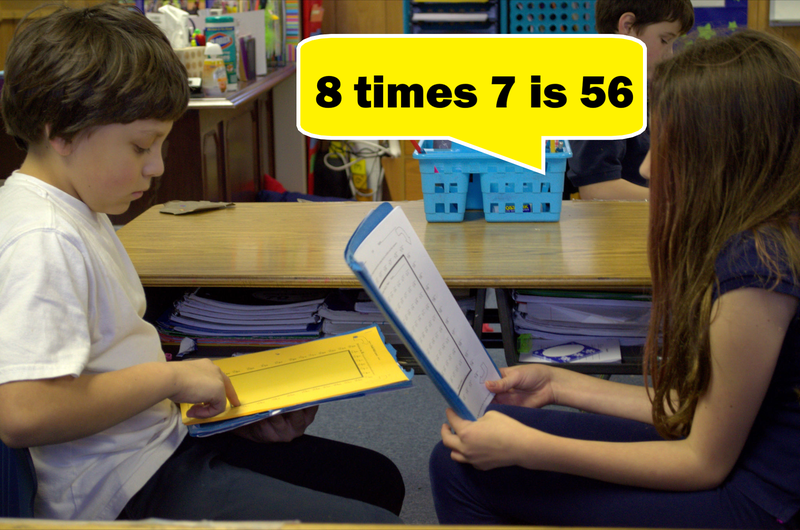 One-minute fluency practice tests are administered every day, to the whole class, and only after students practice in pairs for two to three minutes each. Check out the FAQs page to learn more about conducting 1-minute math fluency practice tests in class. Teachers do NOT need to grade, score, or check daily Rocket Math 1-minute math fluency practice tests unless the student has met their goal. Students do NOT need to grade their own daily Rocket Math fact fluency tests either. 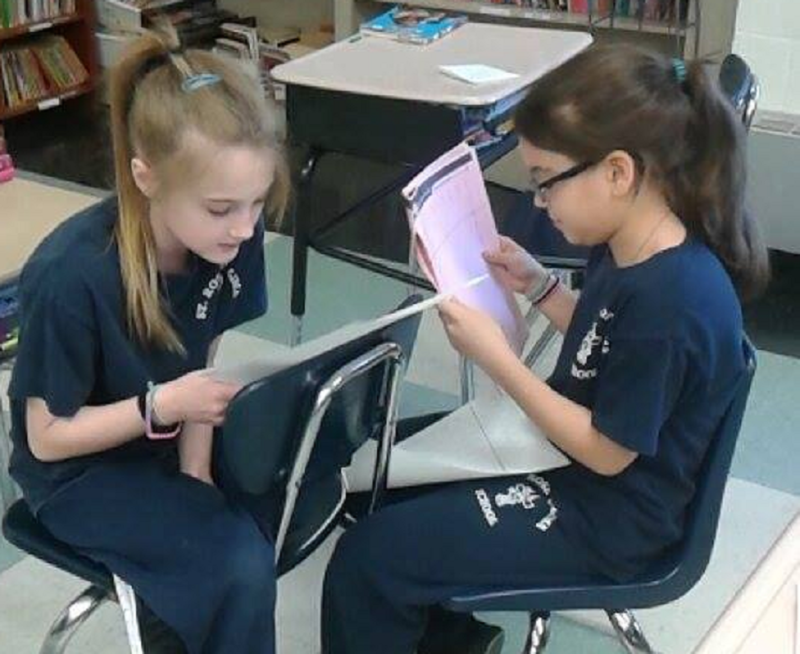 The important part of math fluency practice is the oral practice with the partner before the test–what’s going on in this picture. Because the students are orally practicing every day and getting corrections from their partners, there should be VERY FEW errors on the 1-minute math fluency written tests. Correcting written tests doesn’t help students learn anyway. Corrections are only helpful if they are immediate, the student has to acknowledge the correct answer, and remember it for a few seconds–all of which is part of the oral correction procedure. “Correcting” what’s on the paper takes a lot of time and does not help students learn more, so it shouldn’t be done. But you have to check them before declaring that the student has passed a level. How do you know if a student passes? Students should have a packet of 6 sheets math fact fluency sheets at their level. Each Rocket Math student has an individual goal. For example, if a student has a goal of 32 (based on their Writing Speed Test) and they only do 31, they know they did not pass. If the student does 32 or more, they pass! If a student meets or beats their goal, then have them stand up, take a bow, and then turn their folder into a place where you check to see that all problems were answered correctly. When YOU check (after school? ), make sure all of the completed problems were correct and the student met their goal. If so, then you put the unused sheets in that packet back into the filing crate and re-fill the student’s folder with a packet of 6 worksheets at the next level and hand the folder back the next day. When students receive the new packet of worksheets, they know to color in another letter on the Rocket Chart (and maybe put a star on the Wall Chart). What to do if a student doesn’t pass? Students who don’t meet their goals, don’t pass. These students should put the non-passing sheet into their backpacks and take the sheet home for more practice. The next day they will use the next sheet in their packet of 6. If you want to give them points, do that the next day after they bring back their worksheet where they did a session at home (signature of helper should be there) and all items on the test are completed. If that’s done, they get full points. Sometimes you’ll catch errors on sheets that students turn in as “passes.” If you see an error, the student doesn’t pass. As a result, the student keeps the old packet and has to continue with that same level worksheet. For more information about conducting 1-minute math fluency practice tests in class and how to implement the Rocket Math worksheet program, visit the FAQs page.